The violence took hours to control as deadly fighting rampaged through the jail. Vans of the Legal Medicine Institute (IML) carrying bodies of inmates killed during a riot, leave the Anisio Jobim Penitentiary Complex (Compaj) in Manaus, Amazonia, Brazil. BRASILIA, Jan 2 (Reuters) - Around 60 people were killed in a prison riot in the Amazon jungle city of Manaus, with decapitated bodies of drug gang members thrown over prison walls, officials said on Monday. It was the bloodiest violence in more than two decades in Brazil’s overcrowded penitentiary system. The security chief for Amazonas state, Sergio Fontes, told a news conference the death toll could rise as authorities get a clearer idea of the scale of the rebellion sparked by a fight between rival drug gangs. Fontes told reporters several decapitated bodies were thrown over the prison wall, and most of those killed came from one gang. “This was another chapter in the silent and ruthless war of drug trafficking,” he said. Pedro Florencio, the Amazonas state prison secretary, said the massacre was a “revenge killing” in a feud between criminal gangs in Brazil. The riot began late Sunday and was brought under control by around 7 a.m. AMT (1100 GMT) on Monday, Fontes said. Authorities were still counting prisoners to determine how many had escaped, he added, with reports that up to 300 fled. Overcrowding is extremely common in Brazil’s prisons, which suffer endemic violence and what rights groups call medieval conditions with food scarce and cells so packed that prisoners have no space to lie down. Hours after the Anisio Jobim prison revolt ended, prisoners at in an adjoining detention center began a riot and attempted to escape. Authorities said the situation was quickly brought under control. Watchdog groups sharply criticize Brazil for its prisons where deadly riots routinely break out. 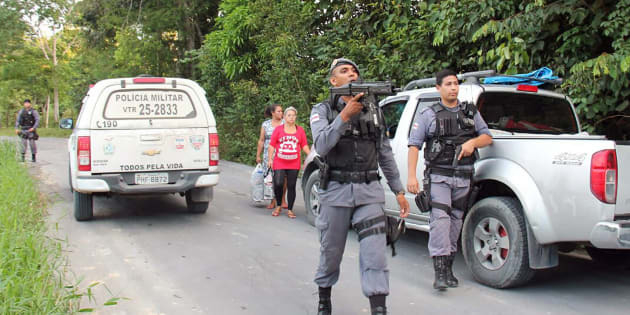 The violence was the latest clash between inmates aligned with the Sao Paulo-based First Capital Command (PCC) drug gang, Brazil’s most powerful, and a local Manaus criminal group known as the North Family. The Manaus-based gang is widely believed to be attacking PCC inmates at the behest of the Rio de Janeiro-based Red Command (CV) drug gang, Brazil’s second largest. A detainee walks in the Anisio Jobim penitentiary complex on June 24, 2015 in Manaus, Amazonas state, Brazil. Security analysts have said that a truce that held for years between the PCC and CV was broken last year, resulting in months of deadly prison battles between the gangs and sparking fears that chaos will spread to other prisons. Sunday’s riot was the deadliest in years. A 1992 rebellion at the Carandiru prison in Sao Paulo state saw 111 inmates killed, nearly all of them by police retaking the jail. Canineu said that for years it has been difficult for states to receive any funding help from the federal government for prisons.